Here they are! 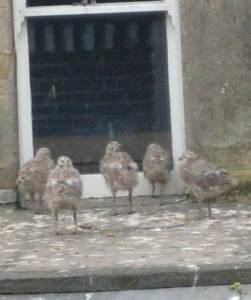 Five baby Herring Gulls looking at their reflection in a window imagining what 500 baby Herring Gulls would look like. Suddenly you wake up one day to discover there are five — not three — baby Herring Gulls! I took this photograph early this morning. It’s possible that there were always five but we only saw a maximum of three at any one time. It’s also possible the two newcomers, who are slightly smaller, slid down from an adjoining roof. In short, we’ll never know. More babies are also spotted on other neighbouring roofs. We’re rapidly going into that point in time when the wings of the baby gulls are growing stronger but they’re still not able to fly. I have yet to succeed in capturing a publishable photograph of a baby gull flapping her wings like crazy and getting one or two inches off the ground but no more. Sadly, as their curiosity grows and their ability to fly increases baby gulls end up on the ground either because they fell off or they tried to fly. Last night we rescued two baby gulls on the ground in our street and took them to the nearby RSPCA Mallydams Wood Wildlife Centre. We were told that they should survive and be returned to the wild. There’s also the National Gull Rescue and Protection group that also deserves our support. Although it seems there are less gulls around than previous years, which is a comment I’ve heard made by others who have lived in the Old Town longer than me, they generate an enormous amount of noise with their screeching and squawking. They’re always noisy but they’re particularly so as their babies approach the time when they leave their nesting areas. I’ve grown to like the sound and miss it when I’m elsewhere and no gulls exist.